I don't often get a chance to dote on Sam. "Isn't it Awesome I have a loose tooth?" Sam asks me. I don't have the heart to tell him, that although I did pretty well with him entering kindergarten, I'm having a little bit more trouble with his tooth getting loose. He's growing so fast. 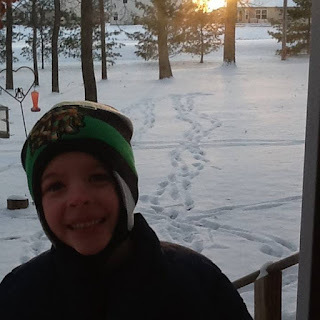 Couple weeks ago, when it was really cold and snowy, they had a delay day, and Sam was the only one willing to go outside and play, he made some snow angels and watched the sun rise. He lasted 3 minutes. But it was good. I thought he was just after some hot cocoa. It's the reward for going outside. He just keeps growing. Not too shabby for me getting crafty. Can you tell what Sam's favorite color is? He's wearing 1,2,3, 4, 5 different green items, and sitting on the green bike. What a ham, my Sam.